I believe that his conduct and the example he set the rest of the men of the Troop, entitle him to the Medal of Honor asked for. On the morning of December 29, 1890, Captain W. S. Edgerly was instructed to position his Troop G of the 7th Cavalry on the east side of the camp on the far side of the agency road, where they remained mounted. 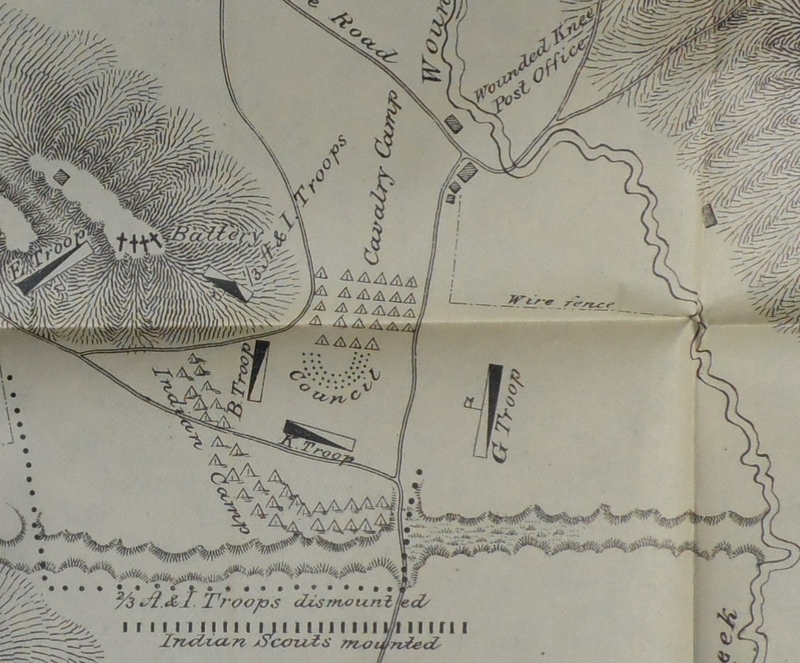 Based on Lieutenant S. A. Cloman’s map depicting locations of the troops at the opening of the battle, it appeared to Major General N. A. Miles and the investigators that if there was any troop endangered by friendly fire when shots first rang out, it was Captain Edgerly’s situated directly opposite that of Captain C. A. Varnum’s Troop B, which was fully engaged at the onset. At the Wounded Knee investigation, Major J. F. Kent and Captain F. D. Baldwin asked Major S. M. Whitside, the first officer called to testify, if he believed Troop G was in danger by their positioning, to which the battalion commander pointed out that no one from the troop was injured. Still, Captain Edgerly’s initial actions indicate that he was concerned for the safety of his troop, as he quickly had them dismount and move the animals into the protection of the ravine just to the south. Among the soldiers of G troop was Private Matthew H. Hamilton, a twenty-five year old Scottish immigrant. He was two and a half years into his first enlistment, and his bravery that day along the Wounded Knee Creek caught the attention of his commanding officer. Private Hamilton’s actions likely occurred while the soldiers of B and K Troops and the Indians in the council circle engaged in a life and death struggle involving small arms fire and hand-to-hand combat. It may also have occurred right after the surviving member’s of Big Foot’s band managed to break through the two cavalry troops. Some of the Indians took up concealed positions inside their tepees and fired back at the troops. Either way, Captain Edgerly’s troop did come under fire such that some of the horses and a pack mule stampeded. Private Hamilton, apparently without waiting for orders and with no regard for his own safety, immediately took action to secure the pack mule loaded with ammunition and then rounded up the other horses. 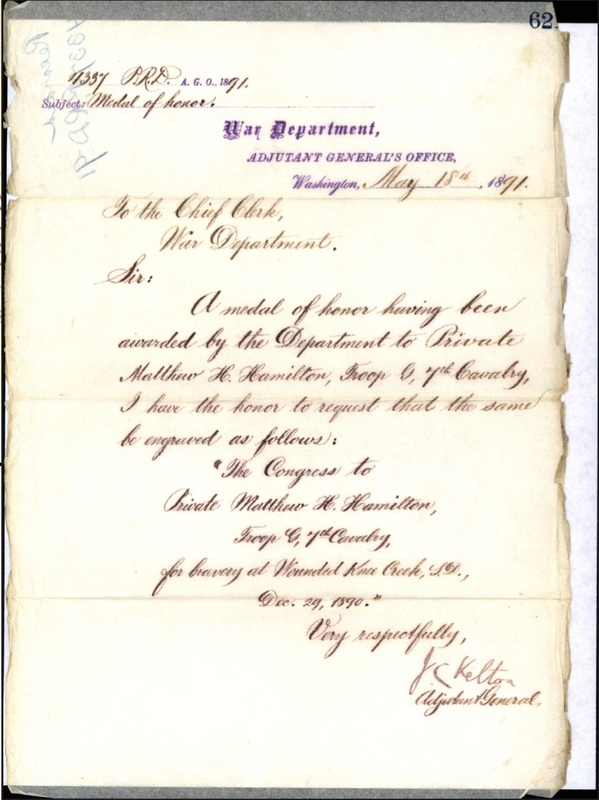 (Click to enlarge) Captain W. S. Edgerly’s original letter recommending Private M. H. Hamilton for the Medal of Honor. (Click to enlarge) Captain Edgerly’s subsequent endorsement in which he provided greater detail regarding Private Hamilton’s actions at Wounded Knee. Respectfully returned. I thought I stated the circumstances of this service with sufficient clearness in this communication, but will enter more into detail with the assurance that the Major General commanding the Army will agree with me that Private Hamilton deserves the honorable distinction for which he has been recommended. At the time the firing at Wounded Knee commenced, my Troop was mounted and near the Indians. I immediately dismounted it and ordered the horses to be taken to the ravine close by, for cover. Bullets whistled over our heads, two horses were hit and they were all more or less frightened. The pack mule carrying extra ammunition and several of the horses stampeded and ran away in the direction in which the bullets were flying. Private Hamilton who had remained mounted, being in charge of the pack mule, immediately dashed after them and, by good horsemanship and nerve, succeeded in bringing the mule to my dismounted line and afterwards in bringing in the stampeded horses. He did a similar thing the next day [at the Drexel Mission fight along the White Clay Creek], bringing much needed ammunition to the firing line and distributing it with much coolness and bravery. I believe that his conduct and the example he set the rest of the men of the Troop, entitle him to the Medal of Honor asked for. (Click to enlarge) Adjutant General J. C. Kelton’s instructions directing a Medal of Honor be engraved for Private M. H. Hamilton. Captain Edgerly’s “assurance” that General Schofield would agree that Hamilton’s actions were deserving of a medal was well founded, as the commander of the Army submitted the recommendation to the Secretary of War on May 12. Acting Secretary L. A. Grant approved the recommendation the following day. Five days later the Adjutant General of the Army directed that a Medal of Honor be engraved. The Adjutant General’s Office mailed the engraved medal on May 25, and it arrived at Fort Riley in time for Memorial Day celebrations. Captain Edgerly presented Private Hamilton the Medal of Honor on Sunday, May 31, at celebrations in Junction City, Kansas, in which throngs of onlookers watched a parade that included a battalion of the 7th Cavalry led by the regiment’s commander, Colonel J. W. Forsyth. Matthew H. Hamilton was born in Stranraer, Scotland. 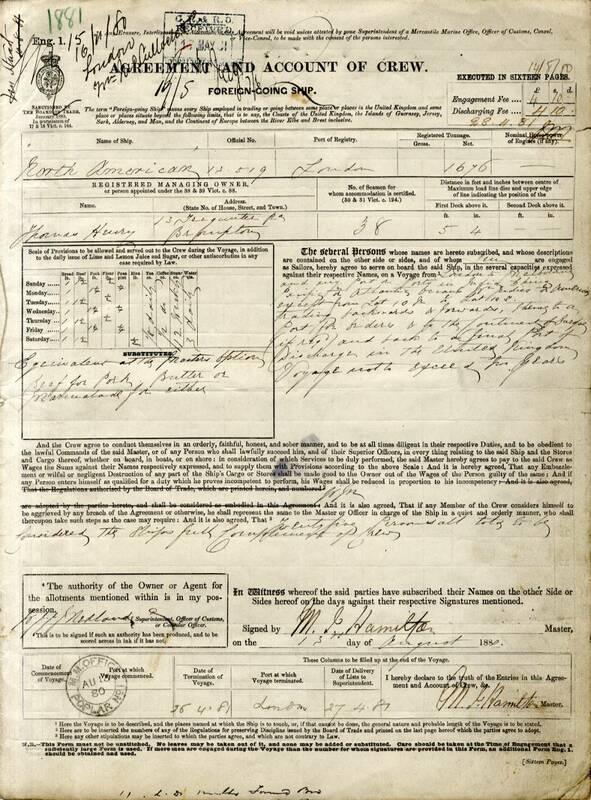 According to enlistment and census records, Hamilton was born about 1865. The 1871 Scotland Census lists a Matthew Hamilton, age 5, living in the Ochtrelure, which was a hamlet of Stranraer in the parish of Inch, Wigtownshire County. Assuming this is the correct Matthew Hamilton, he was listed as the son of William and Christina (nee McDonald) Hamilton, although some genealogists suggest that Matthew was living with William and Christina but was not their son. He is not listed on any other Scotland census with this family. William Hamilton was listed as a farmer, but the family profession held by several of the Hamiltons from Wigontownshire was that of mariner. (Click to enlarge) Record of Matthew H. Hamilton’s first trip to sea in 1881. He served as a Boy upon the ship North American under the captaincy of Matthew J. Hamilton. Matthew Hamilton’s name next appeared on an 1881 ship’s log listing him as a cabin boy aboard the North American. The ship’s captain was Matthew J. Hamilton, possibly an uncle, and the vessel traveled from London to Melbourne, Australia, and returned. The captain, Mathew James Hamilton, was a master mariner for thirty years and died in 1885 when the younger Hamilton was about twenty. According to Australian records, Matthew H. Hamilton was working as an able-bodied seaman out of Hobart, Tasmania, Australia, in 1883. It is likely that Hamilton made a number of trips between England and Australia before arriving in America, possibly after his mentor, Matthew James Hamilton, died at sea in February 1885. By 1888 Matthew H. Hamilton was living in New York City where he enlisted in the Army on July 6. He stated that he was a sailor, and his place of birth was incorrectly listed as Hobart, Australia, where he had previously worked. Hamilton had blue eyes, sandy hair, a florid complexion, and stood five feet nine and a half inches tall. He was assigned to Troop E, 7th Cavalry, and was later transferred to Troop G.
The last known record of Matthew H. Hamilton is the 1900 U.S. Federal Census, in which he was listed as living in Pinar del Rio, Cuba, working with the U.S. Army as a pack master, thirty-five years old, born in July 1864 in Scotland, and having arrived in the United States in 1888. Matthew H. Hamilton was one of 150 foreign-born soldiers awarded the Medal of Honor during the Indian Wars period. However, the Congressional Medal of Honor Society incorrectly lists his native country as Australia because that is what Hamilton listed on his first of three enlistments. All other records indicate he was born in Scotland. The Medal of Honor Historical Society of the United States also lists Hamilton as one of 390 recipients who are lost to history. He is one of three from Wounded Knee, the others being William G. Austin and Marvin C. Hillock. Hamilton’s date and place of death remain unknown, and his final resting place unrecorded. A leading theory is that he died while serving as a pack master in Cuba and is buried on that island. “Presentation of the Medals,” Junction City Republican, May 1, 1891, 8, cited in Surviving Wounded Knee by David W. Grua, New York: Oxford University Press, 2016, 62; “The Sacred Hero,” The Junction City Weekly Union, June 6, 1891, 2. Ancestry.com, U.S. Army, Register of Enlistments, 1798-1914 (Provo, UT, USA: Ancestry.com Operations Inc, 2007), year: 1885-1890, Name: A-D, image: 494, line: 368. According to the 1900 U.S. Federal Census, Hamilton arrived in America in 1888, the same year he enlisted in the Army. Ibid. ; U.S. Army, Register of Enlistments, 1798-1914, year: 1893-1897, Name: A-K, image: 393, line: 353; year: 1898, Name: A-K, image: 570, line: 2673. Ancestry.com, 1900 United States Federal Census (Provo, UT, USA: Ancestry.com Operations Inc, 2004), Year: 1900; Census Place: Pinar del Rio, Cuba, Military and Naval Forces; Roll: 1838; Enumeration District: 0108; FHL microfilm: 1241838. 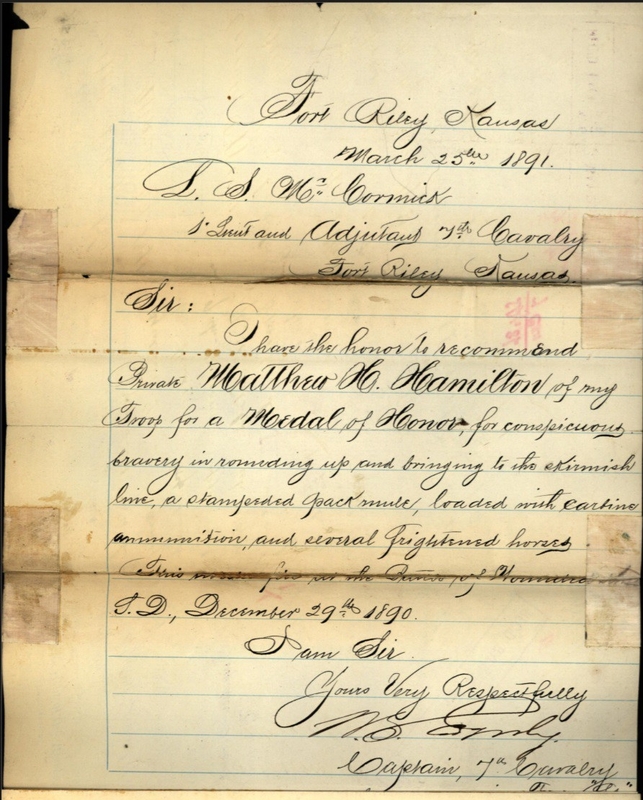 Citation for this article: Samuel L. Russell, “Private Mathew Hamilton, G Troop, 7th Cavalry, A Medal of Honor Recipient Lost to History,” Army at Wounded Knee (Carlisle, PA: Russell Martial Research, 2015-2017, http://wp.me/p3NoJy-1ds) posted 4 Mar 2017, accessed date __________. This entry was posted in Award Recipients, Enlisted and tagged 1890, 7th Cavalry, 7th Cavalry Regiment (United States), Battle of Wounded Knee, Big Foot, Cavalry, Cavalry Troop, Fort Riley, Lakota, Medal of Honor, Pine Ridge, Pine Ridge Agency, Sioux, Wounded Knee, Wounded Knee Creek, Wounded Knee Massacre. Bookmark the permalink. Thanks, Sam. As always, a terrific job. I hope you’re well and staying busy, as I presume you are. Hope that you’re considering coming to the OIW session in May of this year. Thanks, Sam, I will reply ASAP. The Congressional Medal of Honor Society lists Mathew’s Hamilton’s birthplace as Australia because the US Army 1948 Medal of Honor book, the green books from 1963 to 1979 and the US Army Center for Military History did and probably still does list Australia. Having had no success with the US Army Center for Military History in correcting the dates for which Tom Custer was awarded two Medals of Honor I do not think there is much you can do.